Will the second time be the charm for the 3 MegaWatt (MW) GV1’ (prime) Concentrating PhotoVoltaic (CPV) project? Not taking chances with the 1603 Treasury Grant extension or “Begun Construction” eligibility requirements. Like a Phoenix rising from the ashes (twisted metal) of GreenVolts GV1: Demolition Man, the CPV sun was once again rising across the road from the PG&E Corporation (NYSE:PCG) Kelso Substation on a foggy morning in Byron. I’ve been meaning to reconnoiter the old GV1 site ever since “More CPV Action: Greenvolts Scores $7.5M in VC” by Eric Wesoff and Michael Kanellos at Greentech Media. I found one of the “New GreenVolts Design” dual axis tracker arrays under construction oriented lengthwise in a North to South direction. Not a single “Greenvolts GV-235 230W Concentrator PV Module” on the California Solar Initiative (CSI) List of Other Eligible Solar Electric Generating Technologies was installed. Five (5) neat pallet cubes of apparent module frames perhaps with inset PV modules were lined up west of the tracker array. Maybe there is no revelation here. The GreenVolts Customers webpage states “GreenVolts is constructing a 3 MW CPV power plant to fulfill a 20-year power purchase agreement (PPA) with Pacific Gas & Electric (PG&E).” And the $7.5 million in debt funding must have been earmarked for GV1 construction. However, it does escape me when the project was upgraded from 2 MW to 3 MW. As a commenter pointed out, Bob Cart is no longer listed among the GreenVolts Board of Directors although an orphan webpage exists for the moment. 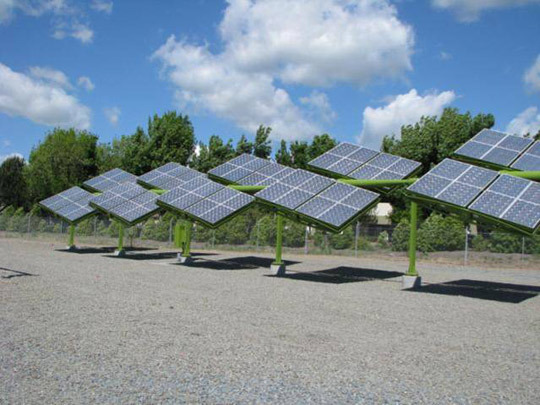 GreenVolts Jolts Concentrating PhotoVoltaic (CPV) Business Plans may have been premature on this point, but the final outcome is the same. I am unable to find any patent applications published or patents issued to GreenVolts either at the United States Patent and Trademark Office (USPTO) or the World Intellectual Property Organization (WIPO). As you may recall, GreenVolts previous Mark I Off-Axis Microdish approach was based upon two exclusive licenses from Lawrence Livermore National Laboratory. Should I continue to refer to the reborn project as GV1’ or use FRINGE like terminology such as GValternate, the other GV1, or GV1another?